It doesn’t matter if you’re throwing a party or just having friends gathered over, the way your house looks from the outside will create the first, and often the strongest, impression for the evening. 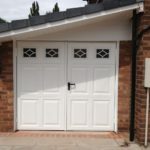 Everything counts and everything matters, from the colour of your front doors and the the state of your windows to the biggest asset (if we’re not counting walls), which is exactly the garage door. Its importance may be paramount for getting the right impression and even more importantly, functionality of your home. Since they’re often neglected, here are some things you should pay more close attention to. You’d be surprised how big of change it can be if you simply paint your garage door and give it a more welcoming and caring note than before. By keeping your house clean and neat from the outside, as well as inside, you will declutter your everyday routine and live a heathier life overall. It’s these kind of efforts that really make a house a home. Garage doors are notorious for being extremely difficult to open over time. In case you do not use your garage door very often, the problem can only get bigger. It can become a huge problem, aside from being irritating in itself. However, you can try out garage door repairs and make your life easier by dealing with the problem as soon as possible. If you opt for buying an insulated garage door, you will be making a smart move. Think about all the rooms adjacent to the garage and how cold can they become during the winter, no matter how much you try to heat up the house. For those people who consider insulated doors to be pricy, it may be important for them to remember that it’s an investment worth giving a try, and we guarantee that it will pay off when you’ll receive your next energy bills. If you decide to invest and make your garage door prettier to look at and your house more inviting and warmer (quite literally), you won’t regret your decision. You can do this project on your own, have some fun with your friends or involve professional help. This is an undertaking worth committing to.